Visit here for all Bulyea Heights homes for sale. The average sale price for a home in Bulyea Heights in Riverbend last year was $546,963. That sale price value is based on a single family detached house, condos and duplexes are not included in that average. The average time to sell a home in Bulyea Heights last year was 46 days. For comparison, the Edmonton average days on market was virtually the same at 45 days in 2013. The highest selling price for a house in Bulyea last year was $680,000, and the most affordable home sold for $458,500. Bulyea Heights has managed to have a higher average sale price for a year, and that was in 2011, in that year Bulyea homes managed to sell for $643,372. Since 2005, the property values in Bulyea Heights have risen by 64%. Over the last 90 days, the average sale price for a single family detached home in the neighbourhood is $554,966 with an average days on market of 89 days. For comparison, the average time to sell a home in Edmonton over the last 90 days has been quicker and is sitting at 54 days. The average sale price for condos in Bulyea Heights in the last year was $519890, with a highest selling price in the neighbourhood reaching $870,000. 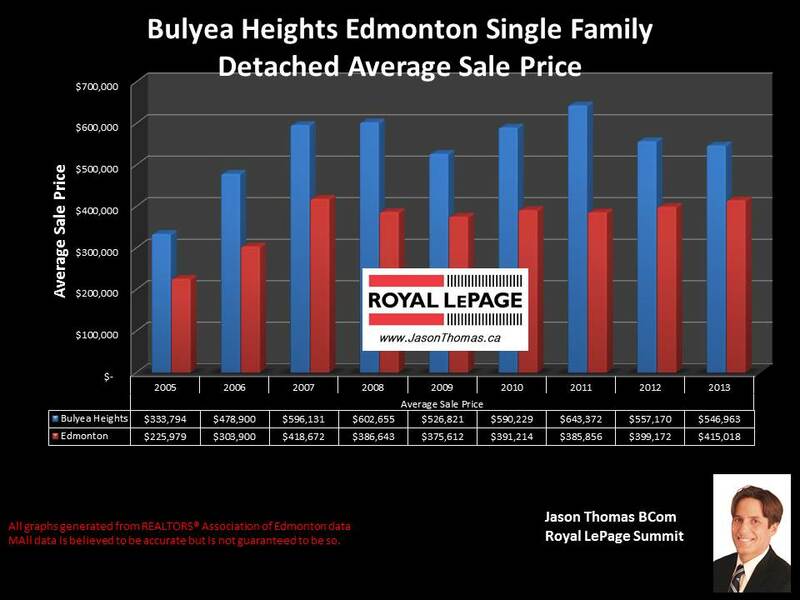 The average time to sell a condo in Bulyea Heights in 2013 was 56 days. The condo complexes that sold in the neighbourhood last year include: Horizon Whitemud, Ravine Point and Brookview Estates. These sales were all in townhouse or duplex style condos that tend to be executive style buildings. Visit Edmonton home prices by neighbourhood for more stats on this neighbourhood and others. If you are interested in a no obligation market evaluation on your home click Bulyea Heights homes for sale.